Read about Week 1 here. Sunday Morning Worship: The Samplarians visited Lord of Life Lutheran Church, where Dan Forehand, who last week talked about radical inclusion, also serves. They attended the crossCurrents service, which is one of the contemporary services. It was a new form of worship for most of them, but they caught on quickly, learning to appreciate the many ways in which Lutherans worship. Photo by Mike Hanck. Used with permission. Camp! : It is the middle of summer, and what is summer without camp? 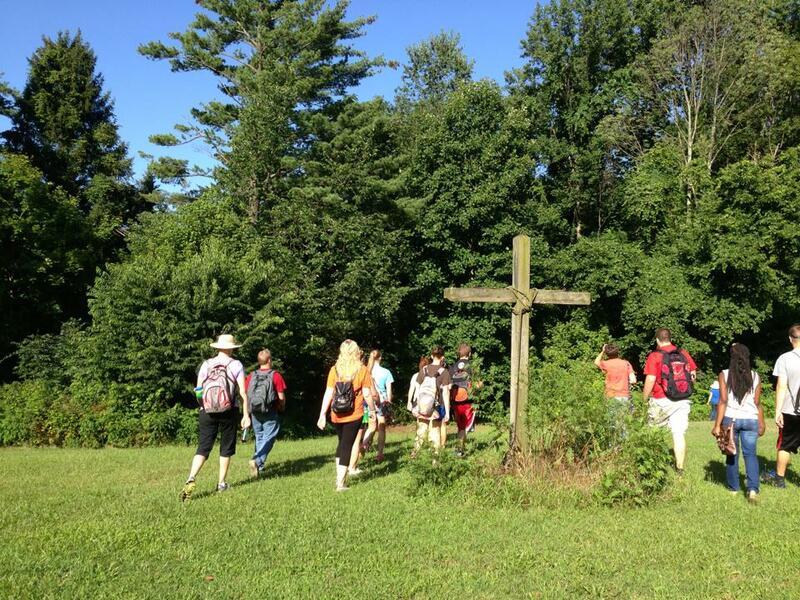 The Samplarians headed to Luther Memorial Camp in Fulton, OH for a day of running around in the great outdoors. They split up and spent the morning with the kids and counselors, and at lunchtime, listened to one of the camp staff tell her story of faith and discernment. The Martyrs: Dr. Clayton Croy introduced the Samplarians to the concept of martyrs. What makes a martyr? Who were some of the martyrs back in the early church, and who are the martyrs today? While sometimes a deep and depressing topic, Dr. Croy ended the week by talking about resurrection, that ultimate Christian hope, to emphasize that death and sadness are not the end. Israel/Palestine: A sensitive topic in some circles, the Samplarians heard a presentation on this conflict from Skip Cornett. He began the presentation by recounting the centuries of antisemitism in history. Then, he traced the history of modern Israel and the land it occupies, in order to help the Samplarians understand the current crisis. While the presentation still left the Samplarians confused, it helped them to recognize that no conflict is simple or has an easy answer. Lutheran Social Services: Having also visited the Mid-Ohio Food Bank, this group of Samplarians volunteered at LSS’s Choice Food Pantry as well. They sorted school supplies for backpack kits, then helped the food pantry customers choose their food. They pushed carts, bagged food, and loaded cars until they had to leave, but their presence definitely had an impact on those they served. Greek Lunch: Community time! 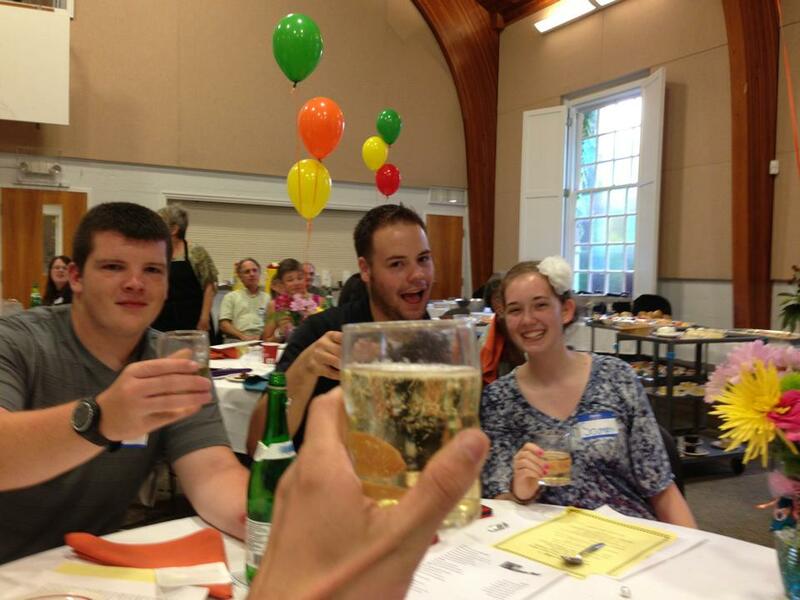 The Samplarians joined the summer Greek students for a Greek-themed lunch filled with salads, casseroles, and hummus. Laura Book may not have dressed in a toga this time around, but the spirit was there, anyway. The Samplarians got to meet new people, and the Greek students enjoyed a time away from the books to simply relax and have a little fun. Practicing for worship. Photo by Mike Hanck. Used with permission. 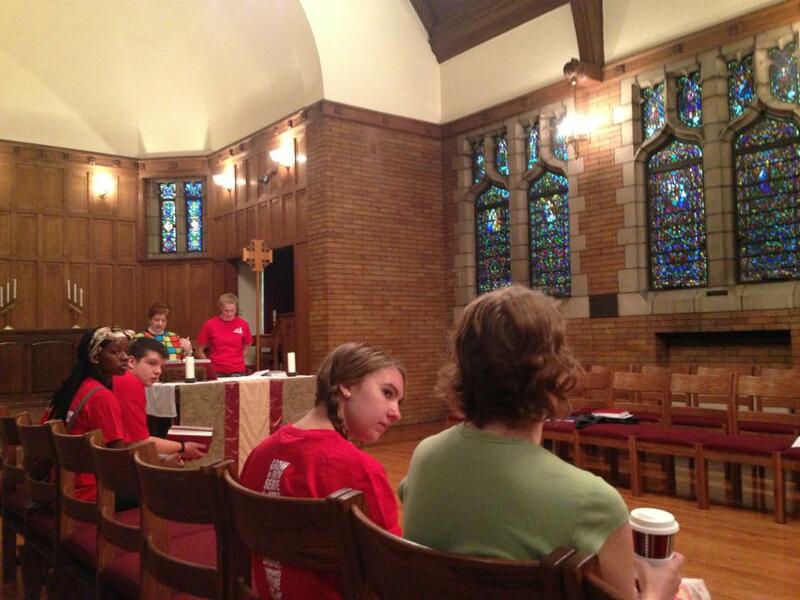 Wednesday Worship: The Samplarians hadn’t been able to participate in the regular worship life of the seminary community, but this week, they were given the task of planning and leading the Eucharist service on Wednesday morning. They brought a diverse set of gifts to the community; some led songs, some played instruments, some lent their voices to reading, and some acted out the parable of the Good Samaritan. The work that went into planning the service was appreciated by all. College Tour: With Capital University right next door, the Samplarians had a perfect opportunity to see a Lutheran-affiliated college. This author was again happy to see the many improvements Capital has been making, and didn’t hesitate to add extra commentary during the tour. Family Lunches: This week, the Samplarians returned to the Ronald McDonald House to cook lunch for the families staying there. Learning from the last experience (raging grease fires), the Samplarians opted this time to bake mini-meatloaves (with a vegetarian walnut-loaf option available). The resident families were again grateful and sent home a thank-you card for the kids. Gospel Slam: The Upper Cup Coffee Company again hosted the Samplarians as they participated in the Academy of Preachers Gospel Slam. This month, the Slam included poetry, prose, comedy, testimony, epic rant, and a clever forward/backward piece. A representative from the AoP was present this month to enjoy the evening and to thank TLS for helping to create the first Gospel Slam. Gahanna Day Camps: On a brutally hot Friday morning, the Samplarians travelled first to Hannah Park, then to Friendship Park in Gahanna, OH, to provide programming for day campers. Using what they learned in Dr. VanMeter’s class, they taught about pond pollution, went on a nature walk, and ran around in the sun for three hours playing games. After an exhausting day, the Samplarians were glad to get into the air conditioning and rest! Toasting the MWA (with sparkling grape juice!). Photo by Mike Hanck. Used with permission. MWA Banquet: The Samplarians had the privilege of attending the banquet celebrating the Mid-Ohio Workers Association’s twelfth anniversary. The highlight of the night, aside from the great food and pro-union sing-a-long, had to be the ethnic dancing. Two fine instructors led the Samplarians and other dinner guests in a number of Serbian, Israeli, and Latin-American dances which both delighted and exhausted! International Dinner: One of the Samplarians this session grew up in Liberia, so for this month’s International Dinner, she cooked some of her favorite foods. The Samplarians were treated to chicken, rice bread, fried plantains, and delicious sugared doughnuts. They appreciated the chance to taste food from another culture, especially when one of their own prepared it. Ultimate! : While the past few weeks were filled with lots of service and presentations, there wasn’t a lot of time for fun and games. Saturday, that all changed. The Samplarians spent the evening playing Ultimate (also known as Ultimate Frisbee) and Camouflage, a game that they learned at LMC. While some of the counselors struggled to keep up, everyone got a lot of exercise and a good cardio workout to end the week. Posted on 26 July 2013 by Pastor KenPosted in Seminary LifeTagged Academy of Preachers, Christianity, discernment, ELCA, Evangelical Lutheran Church in America, Gospel Slam, Lutheran, Lutheran social services, Mid-Ohio Workers Association, Ronald McDonald House Charities, summer seminary sampler, Trinity Lutheran Seminary. Next Next post: Is it right for you to be angry?